This rustic-lux vegetarian recipe is perfect for an easy and elegant dinner party. Brussels sprouts, mushrooms, and crumbled feta are earthy and satisfying while phyllo dough and pine nuts give this dish its signature rustic charm. Round out this hearty meal with a simple salad and roasted garlic. Preheat oven to 325° F with the baking rack in the lower third position. Set aside 1 slightly beaten egg, with brush. Keep phyllo dough wrapped in packaging and thaw at room temperature for about two hours or thaw overnight in refrigerator. Remove thawed phyllo from refrigerator to bring to room temperature when you begin preparing other ingredients. Make the filling: In a large pan, heat 2 – 3 tablespoons extra virgin olive oil over medium heat. When the oil is hot, add Brussels sprouts, onions, piri piri chili salt, freshly ground black pepper, and paprika. Cook for about 5 minutes until Brussels sprouts are bright green, but still very firm. Add an additional 1 – 2 tablespoons of extra virgin olive oil and cook for 1 minute. Add cremini mushrooms, cook for about 3 – 5 minutes or until they become slightly golden. Turn off heat, add 2 oz. crumbled feta cheese and 1 lightly beaten egg. Incorporate well and set aside. Preparing the phyllo crust: Carefully unroll phyllo sheets onto a smooth, dry surface. Cover phyllo with plastic wrap, then a slightly damp, lint-free tea towel to prevent drying out. Uncover to remove phyllo sheets as needed, then promptly re-cover. Spray the inside of a 9x9 baking dish with non-stick butter spray. Beginning at one side of the baking dish, carefully place one sheet of phyllo dough into the baking dish, pressing gently to smooth out any wrinkles. Make sure that there is enough phyllo dough hanging over the edge of the baking dish to fold over the filling later. Brush the phyllo dough with egg wash. Continue layering phyllo sheets, working clock-wise, until you have used ½ package of dough. Remember to add a light brush of egg wash to every layer of phyllo. Assembling the dish: Place the Brussels sprout and mushroom filling into the baking dish creating an even layer. Carefully gather each side of phyllo dough and fold over the top of the filling. Most of the filling will be covered. Spray phyllo dough with non-stick butter spray. The finishing touches: Bake at 325° F for about 45 minutes. 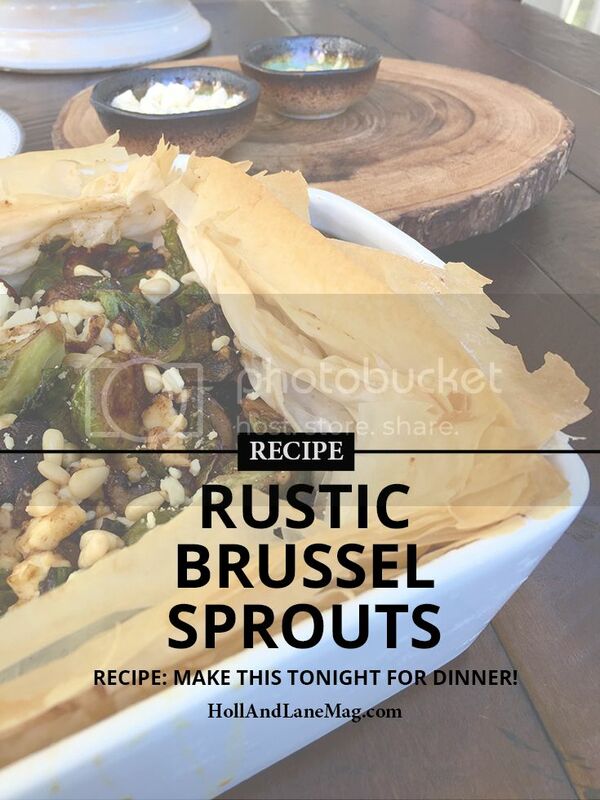 Your dish is ready when phyllo is golden brown and the Brussels sprouts are roasted. Remove from the oven, top with remaining crumbled feta cheese, and let stand for 5 minutes. While dish is cooling, place pine nuts in a dry skillet on medium-low heat. Stir frequently, toasting the nuts until they are golden brown. Top dish with pine nuts and serve immediately. To avoid breaking phyllo, use a very sharp knife to cut. *If you can’t find piri piri chili salt, substitute with ¼ tsp pink Himalayan salt and pinch of red pepper flakes. Artist, musician, and writer at Mostly for Keeps, Elizabeth shares relatable life stories about womanhood in the 21st century. Elizabeth’s signature style is honest, candid, and hilarious. Her unique take on life can be found scribbled across the pages of TODAY Parenting, San Diego Style Weddings, Red Tricycle—where she is a regular contributor—Holl & Lane Magazine, SPOKE, BlogHer, and other local and national publications. Elizabeth’s storytelling is inspired by parenting, friends, fashion, food, and the idiosyncratic charm of the human condition.